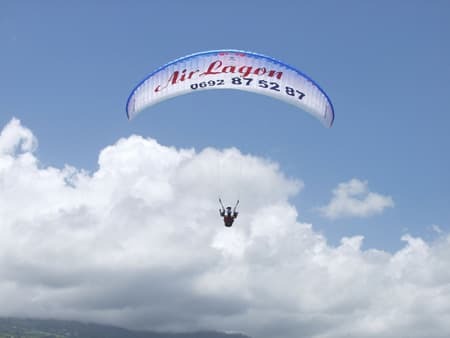 So, to satisfy your desires for exciting adventure, Air Lagon Paragliding offers first flights, courses and tandem or solo paragliding outings. Thrills guaranteed! 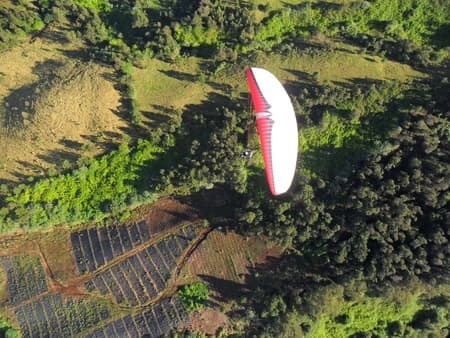 Air Lagon Paragliding is a team of professionals, composed of paragliders who offered the first flights on Reunion island in 1984. 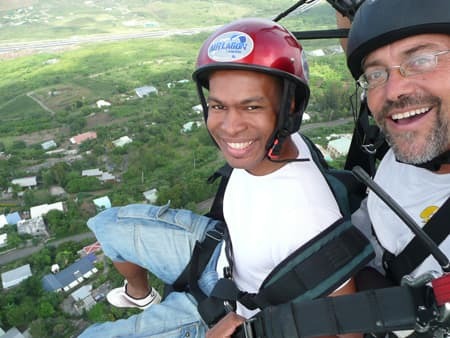 As real professionals, Amel, John, Pascal, Patrick and Vincent will listen to you, and will accompany you, train you and make you fly in the sky of Reunion. 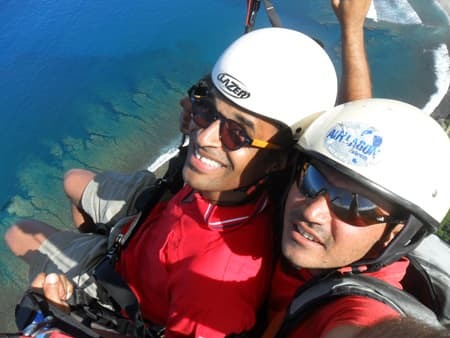 For your stay in Reunion Island, Air Lagon Paragliding offers introductory and advanced courses during several days. • You will learn how to use the equipment. • You will make your first take-off tests on a training hill. 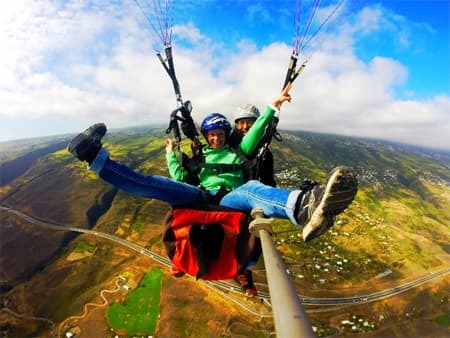 • You will make tandem flights to familiarize yourself with the activity and the altitude. 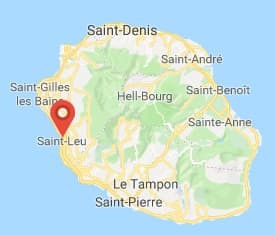 • Finally you can make your first big solo flight, followed by 10 other flights above the Saint Leu sites. Over several half-days, this course is divided into two levels (Advanced 1 and 2). 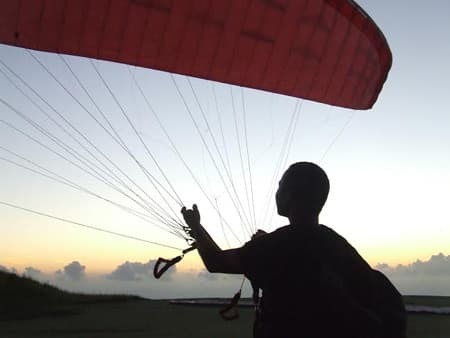 These courses are for addicts wishing to deepen their knowledge and master paragliding. In these development sessions, you will learn how to exploit the dynamic and thermal updraughts, you will improve your mastery of takeoffs and landings, and can start preparing to pilot. 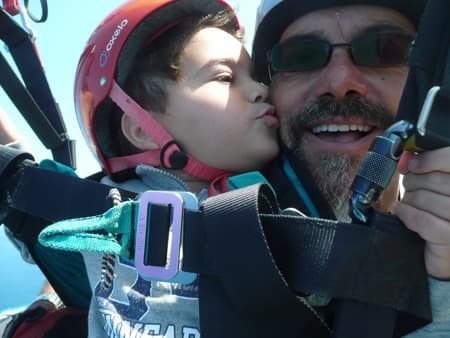 Air Lagon Paragliding offers you to discover Reunion from another angle, from the air, paragliding with an instructor, from 4 years old! 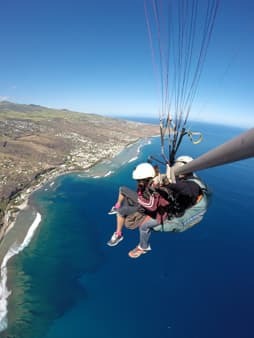 At the controls, a member of the Air Lagon Paragliding team handles the steering while you enjoy the fresh air and the beautiful panorama. 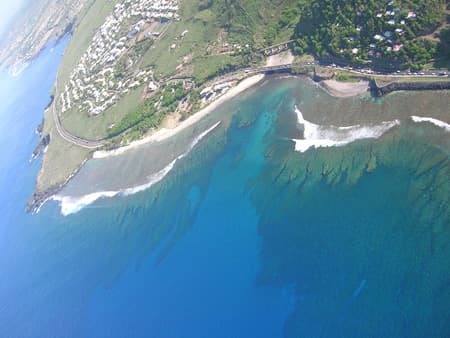 • The Panoramic: a 5300 ft drop above the forests of the heights of the island, then over the lagoon of Saint Leu. 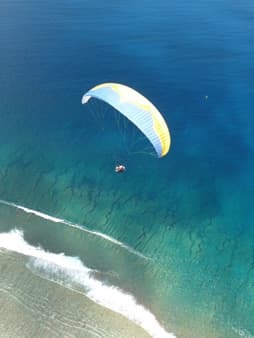 • The Lagoon: an 2600 ft drop during which you will fly over the sugar cane fields and the Corail farm with its sea turtles, and the lagoon of Saint Leu, before landing on the beach. 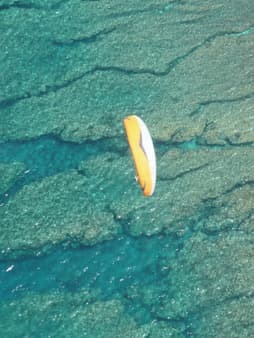 • The Fun: from Les Colimaçons, this flight will attract those who want to try to control and try free flight. No specific route, you will fly where you want, while your pilot will surely give you some thrills through acrobatics. • Mafate’s Doors: an outing to discover the canyon of La Rivière des Galets, near the cirque of Mafate, with views of the Piton des Neiges. • The Maido: start at 6100 ft above sea level for one of the 10 most beautiful flights in the world! 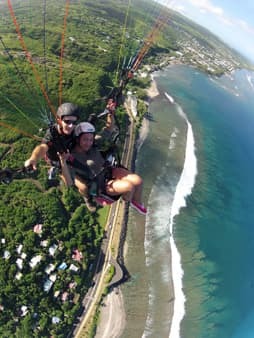 Since the superb view of Mafate from Le Maido, take off right in front of the highest peaks of the island and enjoy the 3300 ft cliff beneath your feet! A professional photographer immortalizes your landings. Optional photos of your flight - delivered on CD-ROM. Photo 2 : From 4 y.o. Photo 6 : like Yannick Noah! Photo 7 : Davy Sicard too! 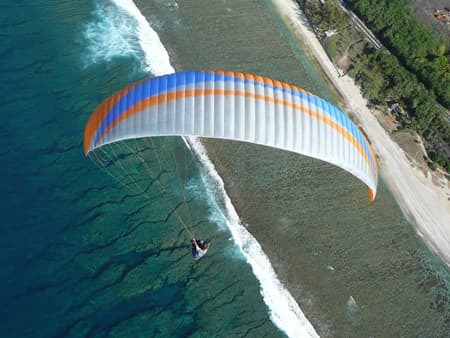 Photo 13 : The Air Lagon Paragliding effect!